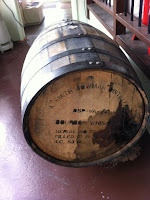 My local homebrewing club, the Charlottesville Area Masters of Real Ale, have been trying to organize a bourbon barrel project for several years now (photo from Barlow Brewing). Aging beer in bourbon barrels has become a popular treatment in the craft beer industry. The general process is to take a finished beer and transfer it to a used bourbon barrel. The beer, which is often a stronger darker ale, is left in the barrel for a period of time, depending on the oak and bourbon character profile desired in the finished product. When that time arrives, based on taste testing, the beer is transferred out of the barrel and moved to packaging. At that time, a new beer is usually transferred into the barrel to keep it from drying out. As subsequent batches of beer are moved through the barrel, aging time must increase to receive similar flavor characteristics because the oak and bourbon flavors gradually leach out of the barrel into the beer. At a certain point, the barrel is deemed flavor-neutral and is either retired from service (i.e. cut in half for planters) or is used to make sour beers where the barrel is simply the place for the wild yeasts and bacteria to live. The transfer and sale of bourbon barrels has long been a steady business in the United States. This is because, by law, bourbon can only be made in new charred-oak barrels. After the bourbon has been removed from the bottle, the barrel is usually sold to a barrel merchant, whose job is to arrange the sale of the used barrels and transport them to their new home. Historically, these barrels were only used to age other types of spirits, such as Scotch, Irish whiskey, Canadian whiskey, tequila, and rum. These beverages do not require the use of new oak barrels and their manufacturers could buy the used barrels for less and have a less aggressive oak character in the finished product. In the last 10 years or so, the American craft brewing industry has become another purchasing stream in the bourbon barrel market. Our club has been planning a bourbon barrel purchase for over a year now and things are finally coming to fruition. I plan on doing several future posts covering our plans and their implementation, including the group brew day and filling day. Stay tuned.